I still have a couple of guitars on my radar. But a guitar of the brand Vintage got my attention too, to be more exact the Vintage V100 Lemon Drop (also known as V100MRPGM). But before I talk about the reasons, I must admit that I just ordered the guitar and got it delivered from United Kingdom in just two days. You might think that I am crazy if I order a guitar online, but first it is not a too pricy guitar, second I could send the guitar back for replacement if something would have been wrong, and the third reason was that I knew the store already and they have good quality control and they do good guitar setups before they dispatch. But now about the guitar. I got interested in it mainly because it’s some kind of a replica of a guitar that Peter Green (Fleetwood Mac) played. 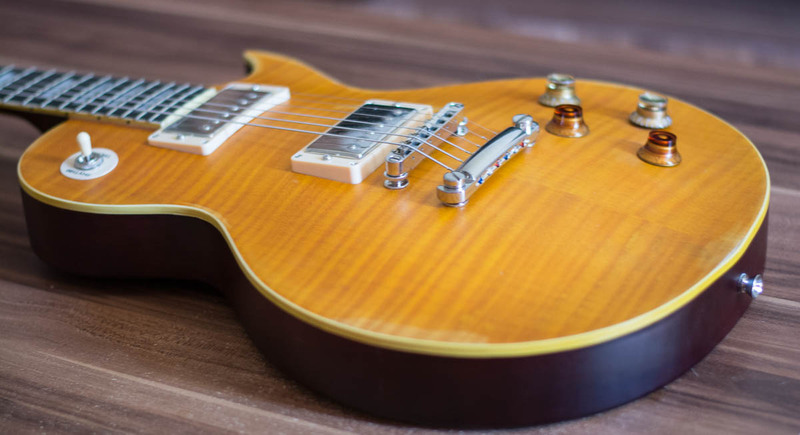 Peter Green played a Gibson Les Paul, but with the V100 Lemon Drop, Vintage designed a Les Paul-style guitar that is influenced by the Les Paul that Peter Green played. Influenced by both, the look and sound. Peter Green had his neck pickup reversed, and this resulted in a guitar tune that people refer to as out-of-phase tone today. Later, Gary Moore got the guitar from Peter, and now the original is owned by Kirk Hammett. So, Vintage did put the pickups into the replica on the same way Peter Green did with the original. The V100 Lemon Drop is out of phase if you use the middle positon of the pickup selector. Since I love to play guitar solos, and since I love this out of phase tone, I had to make a decision. I could have done the same with one of my other guitars, but I like them as they are. 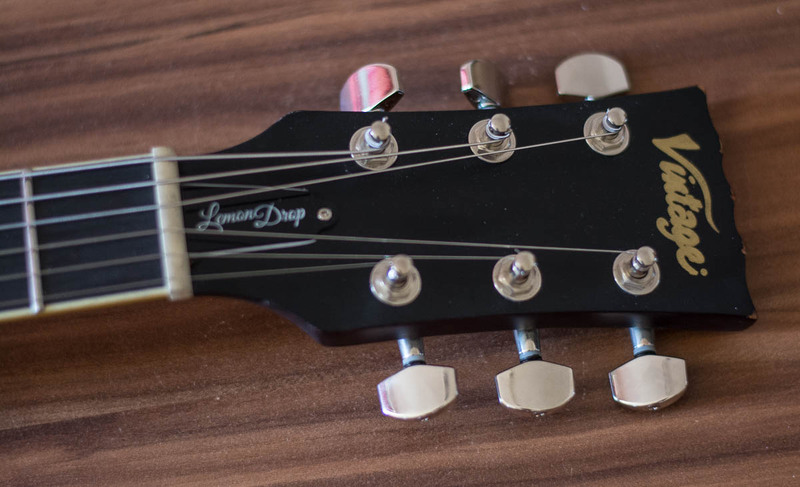 It’s so niche that I rather wanted a special guitar for that, and that’s where the Vintage V100 became interesting for me, especially at this price point. To be honest, to me it was more about the sound, and I didn’t want an exact replica when it comes to the look. Vintage does have two version, the Vintage V100 Lemon Drop Distressed (V100MRPGM), and it copies both the sound of Peter’s Les Paul, and the aged and relic look. The other version is the Vintage V100 Lemon Drop (V100PGM), it does copy the sound of Peter’s Les Paul but not the aged relic look. I would have purchased the normal version because I don’t like artificially aging or artificially relicing. But my favorite store didn’t have the normal version, but my GAS (gear acquisition syndrome) was hard to tame and I just order the distressed version anyway. On some parts the relic effects do actually look great, on other parts it looks like expected, artificial. Like someone else noticed too, the relic pattern on the back looks like a pattern and not like authentic wear as the perimeter looks way too clean. Same for the neck relic pattern, but as a couple of other people wrote, it could be solved by sanding to feather the perimeter a bit out, especially since it is a relic replica anyway, so I won’t be afraid to use sand paper on it. But there are other parts where the relic pattern looks great, especially near the bindings that surround the body. Talking about the binding, I spotted one issue near the bottom guitar strap connection, the binding is not perfectly glued there but I will fix that on my own. But now the more positive points. I got very well used to fatter necks, like the one of my Guild Bluesbird but I still have a thing for thinner necks. And when I did put my hands on the Vintage V100 Lemon Drop neck for the first time, my eyes probably started to sparkle. It’s a thin neck, maybe not Ibanez thin but very thin and I like that a lot as I often mentioned on my blog. The guitar still unplugged but already tuned, I played some chords and liked it, but now I had to plug the guitar in because I couldn’t wait any longer. As I previously mentioned, I pretty much bought the guitar because of the out of phase middle position and playing some solo licks, I got a huge smile in the face when I had the knob in the middle. But it must be mentioned that you need to turn down the volume pots a bit to get that out of phase sound, but then you can’t stop playing the solo, it’s simply fantastic. The neck pickup sounds pretty warm but not too hot, it’s fun to play chords in that position. The bridge pickup is very crisp and somehow almost as twangy as my Telecaster, it really sounds a bit like that. What I like is that all three positions are very distinct and if you play guitars, you might wonder “Wait, isn’t that the point of the pickup selector?” but I mean that I have guitars where the difference is not as distinct. I noticed the same for the pots, with the Vintage V100 Lemon Drop it really makes sense to use them, and my impression is that you can get quite a lot of different tunes out of it. I think the guitar is versatile, and I definitely like the Wilkinson Humbuckers in every position, but especially the out of phase middle position since I do a lot of solo playing. I’ve seen several people mentioning that the guitar has massive sustain and I wouldn’t agree, but it definitely has more than enough sustain. 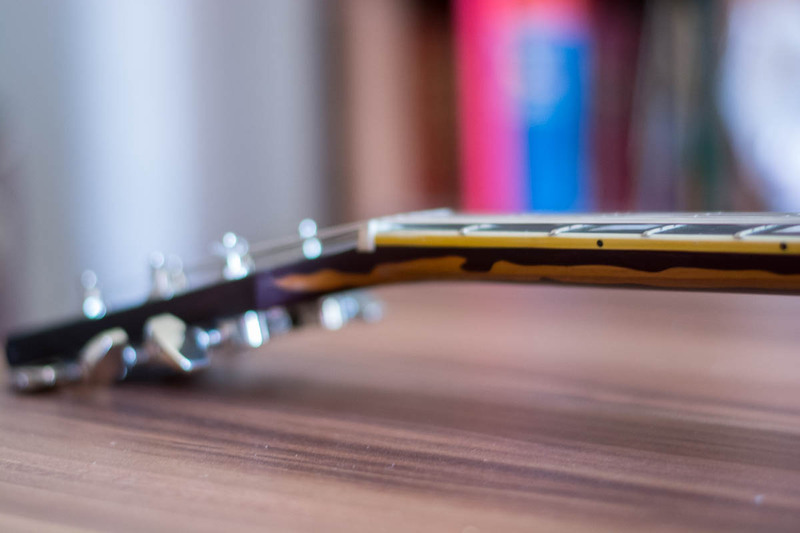 I tried to portrait the guitar from different angles but the angle you mean is also my favorite. I am still somewhat mad that I was not patient to wait for the non-relic version to be in stock. While the artificial aging really looks good at some points, there are also areas where it really just looks like that, artificial. So, I would prefer the non-relic version more when it comes to the look. But the sound of the guitar is simply fantastic. It is, at least on the top and from the sides. I don’t like the relic finish on the back, it looks too artificial but I might sand it to make the aging more real.